To start with Office-QB application, you will need to create a QB-project (Query Builder project). A QB-project will organize your work into a user-specified directory on your system. In this way saving you time and effort by avoiding the undesirable alternative of query files scattered all over your system. In the default New tab of this dialog, enter the Project name field and set the Project storage location via the button next to the edit-box. Note that this 3-dot button will open the standard Windows Browse for Folder dialog, in which you may select a path for project storage files. After entering the project name and path, click on the OK button to create the project. 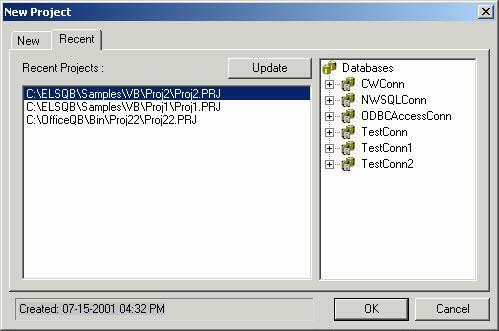 This will display the project as an MDI child window in the main window of the Office-QB application, with the Connections pane containing only the root node, namely the Databases node (note that the Connections pane is located on the upper-right corner of the main window). Note that the Recent tab of this dialog resembles a project explorer, in the sense that, when selecting a recently created project, the project's content is displayed in the tree-view control on the right side of the dialog. 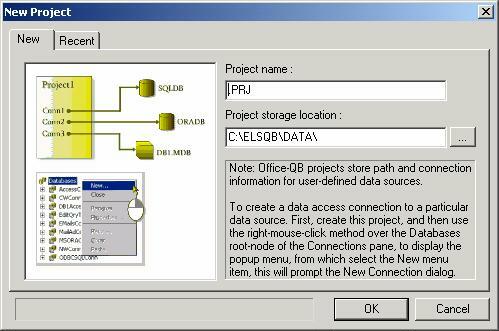 In this way you may explore the project contents before opening it in the main window of Office-QB. Note that since the list of the Recent tab is stored in the system's registry, sometimes the links of this Recent Projects list-box need to be refreshed. This may be done via the Update button. To open an existing project, you may select the project from the Recent Projects list-box and then click the OK button.